When farmers and farming are making headlines on the national news it is rarely a good sign and the present situation is no exception. Dairy farmers have been feeling the pinch for some time now with many receiving less than the cost of production for their milk. The only good news for them is the extremely strong trade on their calves with a new market record price of £450 paid for a 5 week old Limousin cross bull calf at Monmouthshire Livestock Centre last week. Cull cows are also a reasonable trade although back off their peak prices earlier in the year. Best dairy cast cows were around £1000 on Wednesday with beef cows to £1150 for the 66 on offer. It is the sheep trade however which is currently making the news with demonstrations and protests around the country. A perfect storm has hit the industry with a larger supply of lambs arising from increased breeding ewe numbers and a very good lambing in the spring meeting a market with less demand due to the strength of the pound against the euro. The trade is also being undermined by imports from New Zealand lamb at a time when the home grown supply is at its strongest. Huge numbers of lambs in the market a few weeks ago with more than 4000 in a week at the Monmouthshire Livestock Centre prompted a significant fall in trade to less than £1.50 per kg. Whether as a result of the protests or lower numbers forward, trade has improved and in the week commencing 3rd August SQQ was 164.78 per kg At Monmouthshire Market. If however numbers increase again this might prove to be a short lived reprieve. At the end of the day it is a supply and demand issue and probably the best we can hope for is that the lower prices will stimulate demand and help take some of the extra supply off the market. Of course a stronger euro would help and less imported product. We don’t sell prime cattle in our market but somebody must be making a good job of them by the demand for store cattle. 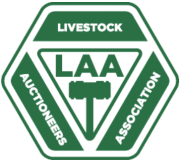 168 of them went through the ring at the weekly sale on Wednesday selling to a fast trade and peaking at £1345 for a 710 kg 26 month old steer, younger cattle 550 – 600 kg were making 220p per kg with yearling steers to £900 (365 kg). Although numbers remain good for the time of year there is a concern that with both dairy and beef producers reducing their herds that we won’t see the usual throughput in the autumn. The scourge of TB is also responsible for smaller numbers as restricted farms cannot sell through the markets and smaller producers give up the struggle. I just hope they don’t all keep more sheep !